The DPMC has published an interactive Critical Zone Mapping System (CZMS) in support of citizen efforts to overcome the continuing failure of the regulatory system. Dominion Energy, with the cooperation of state and federal government, has effectively managed the regulatory process to ensure that essential details and limitations of its plans to avoid environmental harm associated with the Atlantic Coast Pipeline are withheld from the public and excluded from the set of facts considered by the regulatory decision makers. The pattern is well established. FERC, the Forest Service, and the state environmental agencies have all adopted a deferred-analysis approach to the ACP that delays review of detailed site-specific stream crossing plans, erosion and runoff control plans, and steep slope stabilization plans until after project approval. All rely on future completion of Dominion’s Construction and Operation Plan and so-called Best in Class (BIC) program. All are moving toward project approval without critical information required for objective decision making. The CZMS addresses this regulatory system failure by providing a framework for evaluation of the risk associated with construction of the ACP and the limitations of the proposed or available control measures. The CZMS includes user-selectable map layers that display a number of the key factors that should be considered during project review and prior to project approval. Among these are layers that indicate slope steepness, soil erodibility, high-excavation areas, stream crossings, surficial karst, and existing dye traces in karst systems. One of the more-critical map layers identifies those sections of the pipeline corridor and access road system that meet Dominion’s criteria for application of its BIC program. 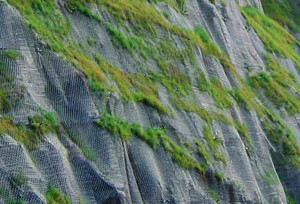 These areas, where the existing ground slope is 30% or more for distances of 100 feet or more, present the greatest risks to downslope water resources due to erosion, slope destabilization, and runoff alteration. Although Dominion has provided what it describes as detailed erosion and runoff control plans, the plans do not include site-specific BIC measures. With very limited exceptions, the actual site-specific details for BIC measures have not been provided to the regulatory agencies and apparently will not be provided until after project approval. 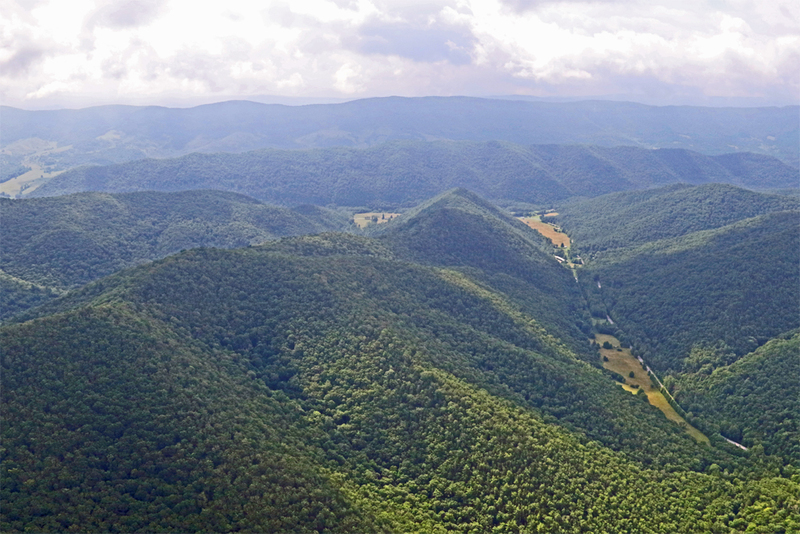 These high-risk BIC sections represent almost half the length of the proposed ACP pipeline corridor and access roads in the mountainous counties of Virginia and West Virginia. Site-specific details for BIC control measures have been provided for only two small sections of the pipeline totaling 0.4 miles in length. One of these sections (0.1 miles in western Virginia) is described in the right-hand sidebar. The red-shaded corridor and access roads sections meet the threshold for Dominion’s Best in Class (BIC) program (slopes of 30% and lengths of 100 feet). Dominion proposes to postpone submission of detailed plans for avoiding erosion, runoff alternation, and slope failure in these high-risk locations until after project approval. 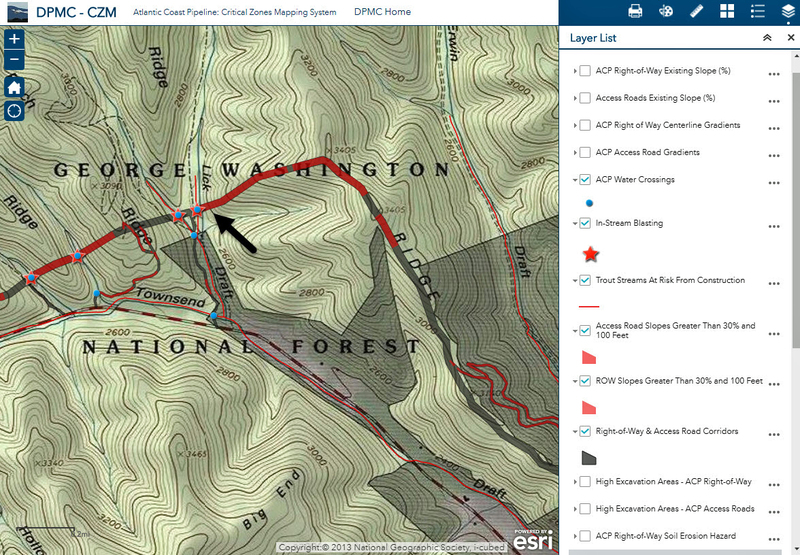 The arrow points to the only location in Virginia for which BIC plans have been provided - a one-tenth mile section at the Lick Draft crossing in western Highland County. Click on the image for a larger version. 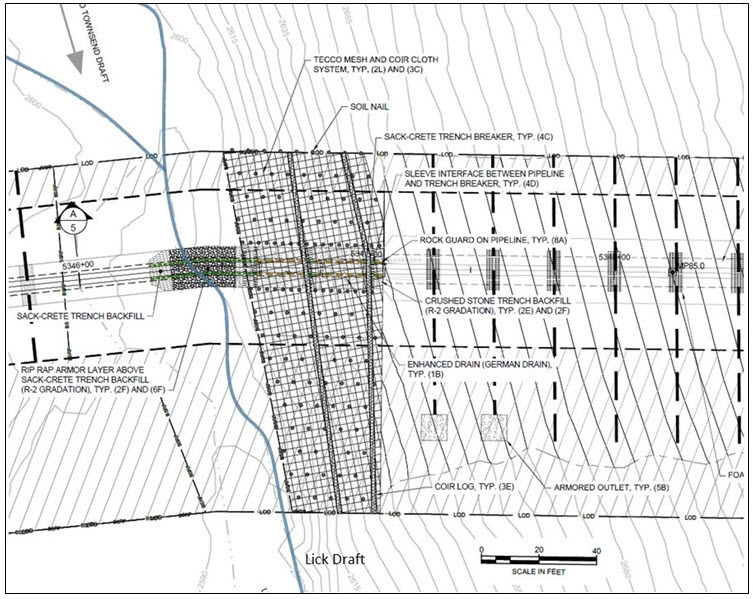 A large section of foot slope will be covered with steel-wire mesh (TECCO). Additional measures include subsurface drainage systems and concrete back filling of the trench blasted through the stream. Control measures included on the ACP plan sheets that have been provided for public and agency review are generally limited to placement of water bars, silt fences, and compost socks. Although steep slopes are present at many locations along the ACP route, the extent to which Dominion will deploy the extreme measures indicated for the Lick Draft area is unknown. Click on the image for a larger version. Heavy steel wire mesh will be used to hold steep mountainsides in place after construction of the ACP. 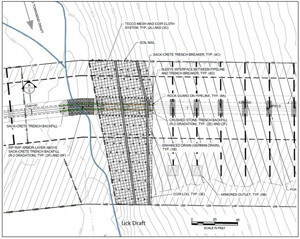 The BIC plans for the slope above Lick Draft indicate that 8 and 15-foot “soil nails” will be fastened with epoxy to hold the steel mesh in place. The use of this extreme measure contradicts repeated statements by Dominion spokespersons concerning the minimal environmental footprint of the project and restoration to preconstruction conditions. Click on the image for a larger version. Pipeline Air Force photo of the ridge between Townsend Draft and Erwin Draft in the upper Jackson River watershed in Highland County. The pipeline corridor will follow the ridgeline. These streams and many of their tributaries support naturally reproducing populations of native brook trout. Click on the image for a larger version.